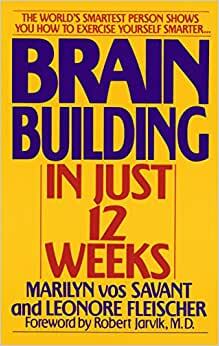 Marilyn vos Savant—credited by the Guinness Book of World Records with the highest IQ ever recorded—brings you an effective, entertaining program designed to strengthen your intelligence and expand your brain power in just twelve weeks. Be smart! You don’t have to go to college to use more of your brain. You’ll see immediate improvement in your confidence, in your self-esteem, in your personal and professional lives. You’ll be amazed at how much more life has to offer when you take control of your brain! Marilyn vos Savant is listed in The Guinness Book of Records Hall of Fame for the highest IQ and writes the popular "Ask Marilyn" column for Parade magazine. She has raised two children and lives in New York City. 5.0 颗星，最多 5 颗星Possibly life-changing. Like another reviewer said, this could be a life-changing book. It encourages you to use all of your brain and to apply that new brain power to your life. Although some of the instructions for the exercises are a little confusing, I have found the exercises worth doing and am taking them seriously. As a matter of fact, I have a question for those of you who have read the book: Is the fourth number series exercise on page 105 (7 22 52 102 180) extra difficult or is it just me? Marilyn just basically urges her readers to be more involved and present in their lives and the world around them. If you have been living a passive existence up to now then you should read this book and discover that knowledge is power! You will find that reading becomes more enjoyable and meaningful when you take steps to expand your vocabulary; making a game out of guessing the temperature makes going outside a little more fun; you can entertain yourself on the bus by thinking of all the ways wombats and kittens and different and similar; next time you read a mystery you can sharpen your intuition by guessing the ending based on clues and then finding out how close you were. Really though, buy this book and enlighten yourself. Your life will be better because of it. Looking to get a little smarter ? This is your book. If you feel want to better yourself intellectually you need to get this book along with Big Brain Academy for the Nintendo DS. Trust me !